You've already missed the first installment, sign up here to get on the list for the next exclusive newsletter! The new MGR CD "Melodic Soloists" is now available in the Shredaholic store! Please note - we are no longer accepting albums for review, and haven't been for some time. I'm now getting too many requests to even respond to, if an album review goes up it's because we've had the CD for a long time, before we stopped doing them. It'll still take us a long time to get those done, so apologies in advance. 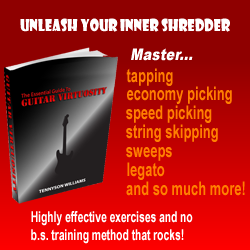 If you'd like coverage on Shredaholic, the best thing to do is write a lesson. It's giving back to your fanbase and is quick for us to put on the site. We still welcome user submitted album reviews, so please feel free to send those in. Copyright © R. Baines 2019 Shredaholic.com. All rights reserved. • Powered by RB Web Dev.